We had a blast spending yesterday with the Inland Empire Technology Leadership Network! This group of 40+ edtech innovators from San Bernadino & Riverside counties meets quarterly to share and learn new strategies to enhance instruction through technology. Yesterday's meeting was full of exciting presentations and hands-on learning. The group discussed George Couros' book, The Innovative Mindset, learned about updates to Common Sense Media from senior program manager Sue Thotz, and discovered how to support women and girls in STEM with Danielle Connolly from Make Them Mainstream. Participants also shared tech tips for translation programs, like Microsoft Translation, Talking Points and Word Lens. We were honored to present with district leaders from Palm Springs USD, San Jacinto USD, Romoland SD, Murrieta Valley SD and Colton JUSD about their professional development experience on the Alludo platform. Each district shared their story: how they got started, how they're leveraging the platform to tailor learning for their teachers, and how they plan to grow their games in the future. It was amazing to see their personalized programs side-by-side, and how each district is taking their own unique approach to PD. We couldn't help but gamify the meeting, so we invited attendees to play IETLN - Game On! From Alludo veterans to first-time players, 46 participants from 22 districts got in on the fun. The activities encouraged players to dive deeper into The Innovative Mindset, share what they learned about CSM, and reflect on the presentation from Make It Mainstream. Players built their PLNs with Twitter activities, identified their Leadership Style, and took selfies with their peers during the icebreaker...and that was just Level 1! 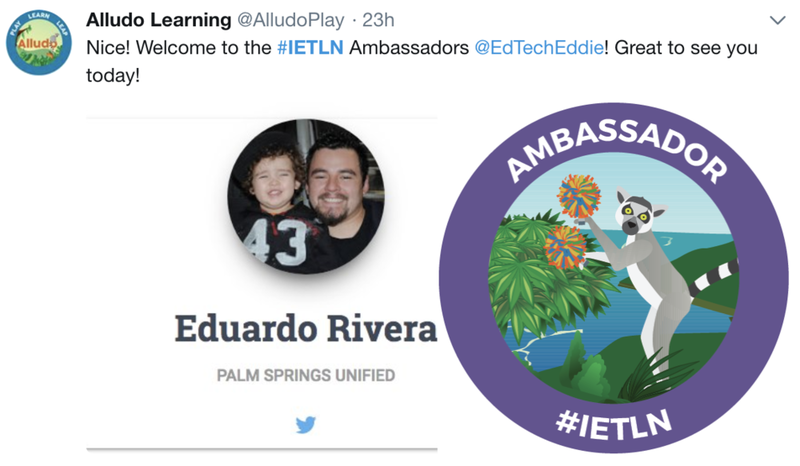 Thank you to our tech leaders from Alludo districts for sharing your stories, and thanks to everyone at #ieTLN for your inspiration & innovation! ...But wait! It wouldn't be a friendly competition without a leaderboard...check out these top scorers from Game On! Katie K. & Margaux C.